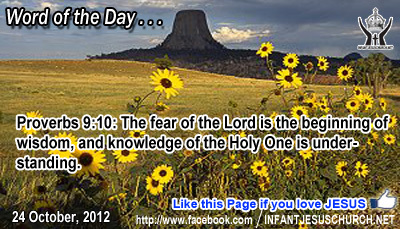 Proverbs 9:10: The fear of the Lord is the beginning of wisdom, and knowledge of the Holy One is understanding. Heavenly Father, and Eternal God, we confess that we know you so much less than you know us. But your faithfulness in our life, your power shown in history, your grace shared with so many through the cross of Jesus, and your promise to bring us home to you one day all help sustain us. We want to know you so that our life can be lost in your will -- not for our glory or gain, but for your praise, we ask that you make yourself known to us in the things we do today. In the name of Infant Jesus we ask this. Amen. Jesus calls each one of us to be vigilant in watching for his return and to be ready to meet him when he calls us to himself. The Lord gives us his Holy Spirit so that we may have the knowledge, help, strength, and wisdom we need to turn away from sin to embrace God's way of love, justice, and sanctity. The Lord's warning of judgment causes disappointment for those who are unprepared, but it brings joyful hope to those who keenly wait for his return in glory. God's judgment is good news for those who are ready to meet him. Their remuneration is God himself, the source of all truth, beauty, goodness, love and everlasting life. Loving Infant Jesus, you have captured our heart and it is yours now. Take it that we may have you alone as our treasure and joy. Make us strong in faith, unwavering in hope, and generous in love that we may seek to please you in all things and bring you glory.